Tasting a well-aged balsamic can be an amazing experience. But unless your bank account is ample, it can be a costly hobby. Here's a way around it. This set comes with precious, small bottles of La Vecchia Dispensa's aged balsamics, about an ounce total (the strawberry is illustrated next to the bottles for scale). Like vials of perfume, just way tastier. Include a loaf of Paesano Bread or a bottle of Zingerman's Olive Oil to complete the package. 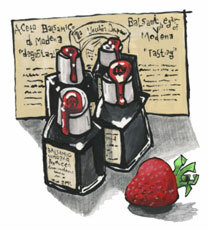 There have been some changes in the Italian laws in labeling balsamic vinegars. Where producers used to use ages to denote the flavor and quality of a vinegar, today they must use density to accomplish the same task. Now, each little vial notes its density. The lower the density, the younger the vinegar.